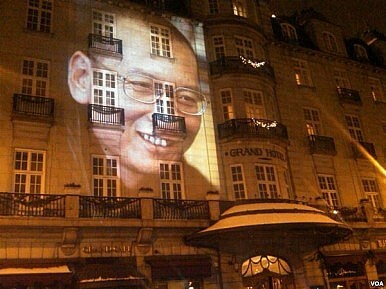 A portrait of Nobel Peace Prize winner Liu Xiaobo is projected on the Grand Hotel Oslo. It has now been over five years since political relations between China and Norway were downgraded after the awarding of the 2010 Nobel Peace Prize to Chinese dissident Liu Xiaobo. The extent of this political deadlock is by now unprecedented in the recent diplomatic history of the two countries. This situation has allowed for some salient insights to be drawn on Chinese foreign policy, based on the aspects where the Sino-Norwegian case is similar to or different from other instances of diplomatic pressure from Beijing. Analyzing current Sino-Norwegian relations does, however, require a degree of precision which has at times been lacking in media reports, in particular on two accounts. First, the diplomatic freeze has not resulted in a rapid downturn in economic relations, contrary to predictions. Bilateral trade reached record highs in 2015, with Norwegian imports from China jumping from $6 billion in the previous year to $7.3 billion. Furthermore, for the first time, China is the sixth-largest recipient of Norwegian mainland goods, with a total value of $2.7 billion. Although there are disruptions to Norwegian salmon exports to China, they continue to reach Chinese markets, sometimes via third countries. In 2015, Norway was also accepted by China as a founding member of the Beijing-backed Asian Infrastructure Investment Bank (AIIB). Somewhat ironically, this lack of economic urgency may be a contributing factor to the longevity of the political freeze in China-Norway relations, as sustained pressure from economic actors for a swift resolution to the diplomatic impasse has been limited. However, this is not to say that the economic relationship is pristine. New opportunities for business contacts and joint ventures were lost once the disagreement began to stagnate, and once-promising bilateral free trade negotiations have been in abeyance since 2010. A second factor which sets the Norwegian case apart from most other Sino-European diplomatic conflicts is its institutional context. Despite media reports to the contrary, Chinese and Norwegian officials concur that Beijing is not demanding an official apology from the Norwegian government for the Nobel Committee’s decision in 2010. However, questions of responsibility and degrees of culpability, aversion to losing face, and public sentiments have since complicated the situation, along with disagreements over the relationship between the government and the Committee. Unlike many comparable cases, such as the Dalai Lama’s 2009 visit to Copenhagen, when the Danish Parliament later made a statement on its own actions, the source of Beijing’s reactions center on an actor independent of the Norwegian government and to some extent the Norwegian government’s handling of the decision by the Committee. The role of this third party has complicated the issue, and thus conceivably contributed to the prolonging of political sanctions. Beijing has at times taken issue with the definition of the Nobel Committee as ‘independent’, particularly since Committee members are appointed by the Norwegian parliament, and its composition reflects the structure of the sitting parliament. One conceivable solution is to better separate the Committee from the mechanisms of Norwegian domestic politics, ensuring greater autonomy. This may allay outside doubts about the role of the government in the Peace Prize process, and serve to strengthen the Committee’s core values of credibility and political independence. The extant independence of the Committee has, however, remained a fundamental principle for Oslo, as emphasized during pre-2010 Chinese attempts to lobby against awardinga Prize to a Chinese dissident. Oslo therefore has few tools and little room to maneuver, contributing to the continuing impasse. Still, it is worth noting that during the last few years, adjustments have been made to further strengthen the autonomy of the committee and weaken any ties to Norwegian politics. There have been recent changes in the Committee’s leadership and members, and the government of Erna Solberg has also affirmed that it is not informed about the decision of the Committee prior to the announcement. Beyond economics, the rationale for restoring ties between China and Norway has only been strengthened. The array of global policy issues which are of mutual interest to Beijing and Oslo continues to grow, but they too have languished at a time when joint dialogues should be more important than ever. These areas include energy policies, shipping, investments, green technologies, science, gender, and comparative governance, including the “Nordic model” of the welfare state which Beijing has been examining in light of its current structural reforms. The polar regions are also a source of potential cooperation, especially given China’s 2013 admission as an observer in the Arctic Council, which Oslo supported. There are also ample opportunities in the fields of global governance, development, and peacekeeping and peace-building, in which China has become increasingly involved. The resurgence of global terrorism is also a subject for dialogue, as illustrated in November 2015 when a Chinese and a Norwegian national were executed by ISIL militants. Since 2010, Norwegian governments have also undertaken a range of initiatives to solve the situation, both openly, such as via a published op-ed by then-Foreign Minister Jonas Gahr Støre, and through diplomatic channels. Erna Solberg’s government faced massive public disapproval for not meeting with the Dalai Lama during his May 2014 Norwegian visit, in an attempt to signal goodwill to Beijing. However, there have since been events that further damaged relations, including a September 2014 leak of a Norwegian government memo outlining internal debates about resolving the dispute, a February 2015 threat assessment by the Norwegian Intelligence Service (PST) which cited Beijing as a potential challenge to cybersecurity, and the subsequent deportation of a Chinese student on charges of espionage that was later overturned in Norwegian courts. Given that this diplomatic stalemate touches upon core interests in both countries, and that some of the factors causing tensions are beyond government control, it is not easy to see a rapid solution. A common refrain from Chinese policymakers is that “whomever tied the bell to the tiger needs to untie it,” implying that Oslo has sole responsibility to resolve the matter. Others see this situation more akin to another Chinese proverb, namely “killing the chicken to scare the monkey,” implying that Beijing is using the incident as a cautionary tale to others. There should be serious concerns that the dispute will ossify if it is allowed to continue in its current state. The opportunities for misunderstandings on both sides are great, and the instruments for developing shared understandings and cooperation are, at present, too weak. What can and should be done in the short term is therefore for both parties to encourage bilateral governmental and sub-governmental research dialogues on joint policy issues, This move would improve the understanding of the rich possibilities for both parties by deepening cooperation on pressing issues of trade, welfare and international cooperation. Marc Lanteigne is a senior research fellow for China and East Asia at the Norwegian Institute of International Affairs. Bjørnar Sverdrup-Thygeson is a research fellow at the Norwegian Institute of International Affairs.